You are here: Home » FAN-ATICS » Star Wars » Wookie laughing woman. 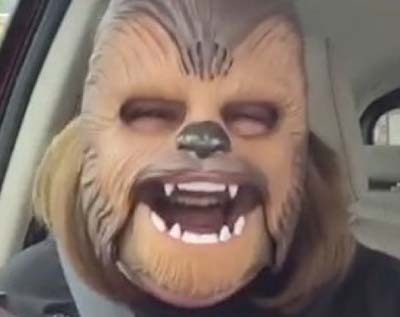 Wookie laughing woman may sound like a country and western influenced Star Wars hit, but here’s a joyful little video of the pleasure that wearing a wookie mask – complete with voice-box – can bring you. Got to get me one of those masks! Chewie Tune – the song of the wookie. « Awesome science fiction and fantasy round-up (Offworld Report: Sunday 22nd May 2016).